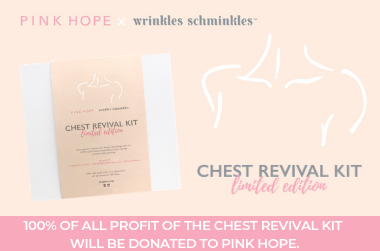 Wrinkles Schminkles is a range of 100% Medical Grade Silicone Pads that are worn while you sleep and treat Chest & Décolletage, Forehead & Eyes, Mouth and Neck wrinkles. Our Silicone Pads keep the skin taut so it can&apos;t crease or wrinkle while the healing properties of the Medical Grade Silicone create hydration and moisture - all while you sleep! For best results of our range, use our Cleaning Solution to clean the pads and get more uses and our Morning After Glow serum to treat the delicate skin structure of the Chest, Décolletage and Neck during the day. Specially formulated with both active and natural ingredients to plump fine lines and leave your skin glowing. Little miracles, all of them. The chest pad works overnight, wrinkles are gone in the morning. Perfect trio, each complimenting each other.